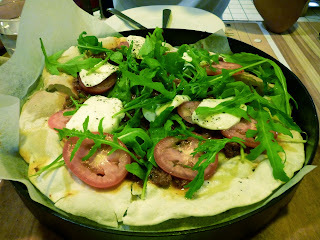 Had an early dinner at Skinny Pizza at Wheelock today. I have been to this restaurant once before and wanted to come back to try out other stuff in their menu. We ordered one pizza and pasta to share: Bolognese with Mozarella Pizza (SGD 23.00) and the Lobster Linguine (SGD 22.00). The Bolognese with Mozarella Pizza was very enjoyable. It was reminiscent of a taco salad. It had slices of mozzarella, beef bolognese, and rocket. I liked the texture and crunch of the super skinny crust which went well with the toppings. The restaurant ran out of lobster, so they replaced the lobsters with tiger prawns which was fine by me. However, the linguine sauce was a tad too peppery. 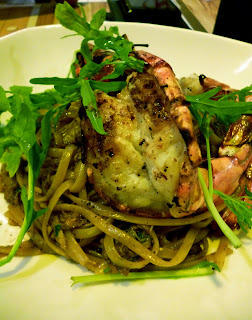 I normally enjoy pepper on my Black Pepper Crab, but it's not something I really enjoy with pasta. There was too much heat and saltiness which overpowered the prawn. This visit to Skinny Pizza was fine, but I think I ordered better dishes the last time I was here. Next time I'll stick to their tomato-based pastas -- was quite happy previously with their Meatball Spaghetti. Pizza was still very good though!